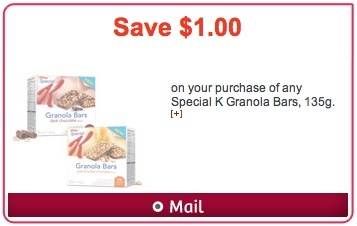 Special K Granola Bar Coupon to Save $1 can be found on Websaver’s website. This is one of Websaver’s website hidden coupons. Visit this Websaver’s website, select that this coupon be mailed, create your account and claim your coupons. You need to select at least 4 websaver coupons before they mail it out to you. You will receive your coupons within 2-3 weeks. You can find the hidden coupon here. 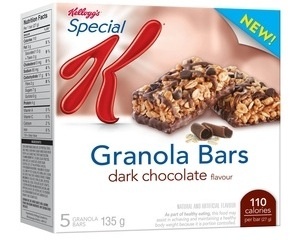 Don’t be afraid of the dark…Special K™ Dark Chocolate Granola Bars! Indulgent dark chocolate flavor meets positively nutritious ingredients in a snack you can feel good about loving. Dark Chocolate Granola Bars deliver 4g of protein and 4g* of fiber in every bar, so you can satisfy your chocolatey cravings while still staying on track. Also available for purchase in single serve packages. Special K™ Protein products are designed to increase daily intake of protein and fiber while managing caloric intake. Diets high in protein (30% of total daily calories from protein) have been shown to help reduce hunger longer.